In November 2014, the Obama administration announced the Deferred Action for Parents of Americans and Lawful Permanent Residents (DAPA) initiative, which built upon a program instituted two years earlier, the Deferred Action for Childhood Arrivals (DACA) initiative. As mechanisms to channel the government’s scarce resources toward its enforcement priorities more efficiently and effectively, both DACA and DAPA permit certain individuals falling outside those priorities to seek “deferred action,” which provides its recipients with time-limited, nonbinding, and revocable notification that officials have exercised prosecutorial discretion to deprioritize their removal. While deferred action thereby facilitates a highly tenuous form of quasi-legal recognition for its recipients, it does not provide legal immigration status. Accordingly, the two initiatives are not an equivalent substitute for legislative reform proposals that would create a pathway to durable legal status for a much larger number of individuals. Nevertheless, critics have accused the Obama administration of imposing by decree precisely that which Congress has declined to authorize by statute: namely, legalization of noncitizens who lack lawful immigration status. In this Article, I critically examine those assertions and develop a rationale for the deferred action initiatives, anchored in rule of law values, that has received no meaningful attention in recent debates about DACA and DAPA. As the decision by U.S. District Judge Andrew S. Hanen enjoining those initiatives illustrates, legal discourse has mirrored and reinforced the same incorrect claims about deferred action that circulate in anti-immigration political discourse. Like the Obama administration’s political critics, Judge Hanen repeatedly mischaracterizes the initiatives as providing “legal status” and, on that basis, flays the Obama administration for “total[ly] abdicat[ing]” immigration enforcement. These conclusions ultimately amount to what I describe elsewhere as “judicial truthiness,” highlighting an erosion of the conventional lines between litigation, adjudication, and public discourse in politically salient cases more generally. The flawed discourse surrounding DACA and DAPA underscores the need for a more careful assessment of the complex relationships between enforcement priorities, prosecutorial discretion, and the rule of law in an era of mass deportation. The blunt and distorted nature of that discourse, however, in turn has distorted the substantive analysis of those relationships. 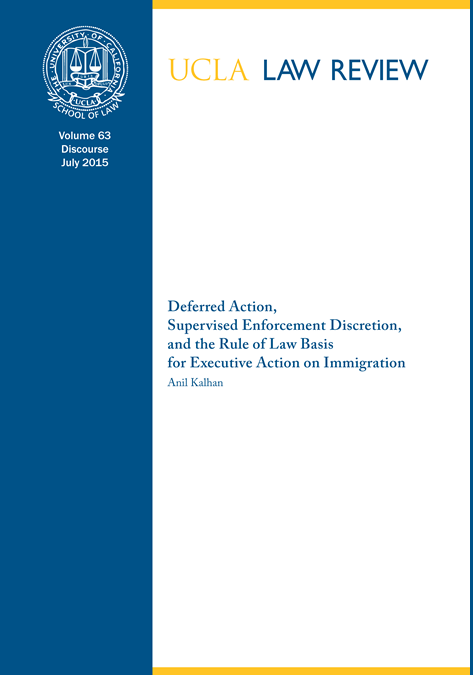 As the scale of the expansive and fragmented immigration enforcement regime has grown to such enormous levels — making the interrelated challenges of ensuring consistent execution of the law and fidelity to enforcement priorities more formidable — the need for effective mechanisms to supervise the discretion exercised by rank-and-file officials has only grown more important. But even as it purports to respect the government’s enforcement priorities, the logic of Judge Hanen’s ruling would largely disable policymaking officials from implementing such mechanisms, requiring them instead to let the vagaries of the bureaucracy reign supreme. The decision therefore not only inhibits the agency’s ability to establish enforcement priorities and manage its scarce resources, but also fails to acknowledge the importance of rule of law values such as consistency, transparency, accountability, and nonarbitrariness in the execution of the immigration laws.